Michael J. Bassett is one of those bubbly young filmmakers who talk endlessly of their love for genre films and can’t seem to translate that enthusiasm into anything that stands as a classic in it’s own right. Not like Danny “I’m the biggest ‘Judge Dredd’ fan ever” Cannon (yes, I’m still bitter), more like a Stephen Norrington Syndrome, or maybe a Paul W.S. Anderson Disease. They are successful in The System, unlike true visionaries like Richard Stanley and Mariano Baino who’s passion make them pariahs to the Hollywood Machine. Of course, in Stanley’s case, it may have also had something to do with him dropping acid on the set, but whatever, the point stands. After Robert E. Howard was honored post-mortem by one of the finest testosterone-laden, blood and thunder fantasy films ever made in CONAN THE BARBARIAN (1982), he was largely forgotten by everyone in Hollywood. Well, actually he was largely abandoned after everyone realized they could simply rip off CONAN. CONAN begat a sequel so bad, it even made me cringe, and I’m a guy who will cheerfully sit through the non-Joe D’Amato Ator film THE IRON WARRIOR (1987) on a semi-annual basis. 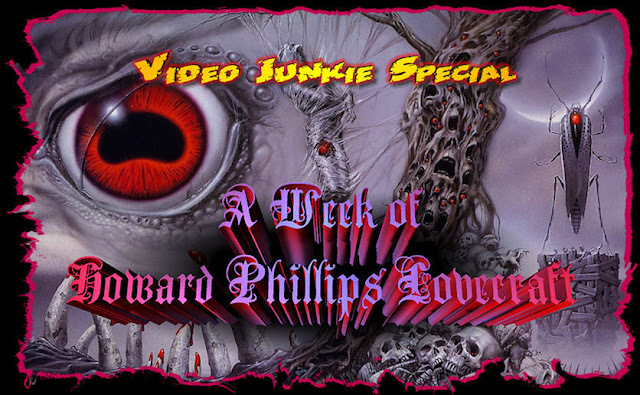 In 1997 Mr. Howard would no longer be ignored as the decades of development hell finally ended and Howard’s grave was pissed on by TV director John Nicolella with KULL, in which Howard’s most violent and dark anti-hero was turned into a goofy, foppish nancyboy courtesy of Kevin Sorbo. The good news is nobody has seen fit to give Nicolella one red cent to direct a movie since. I guess there is justice in the world after all. 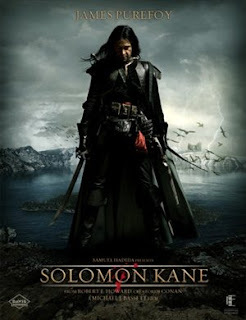 After firmly declaring the under-appreciated PATHFINDER as the sword movie of the decade, along comes SOLOMON KANE. 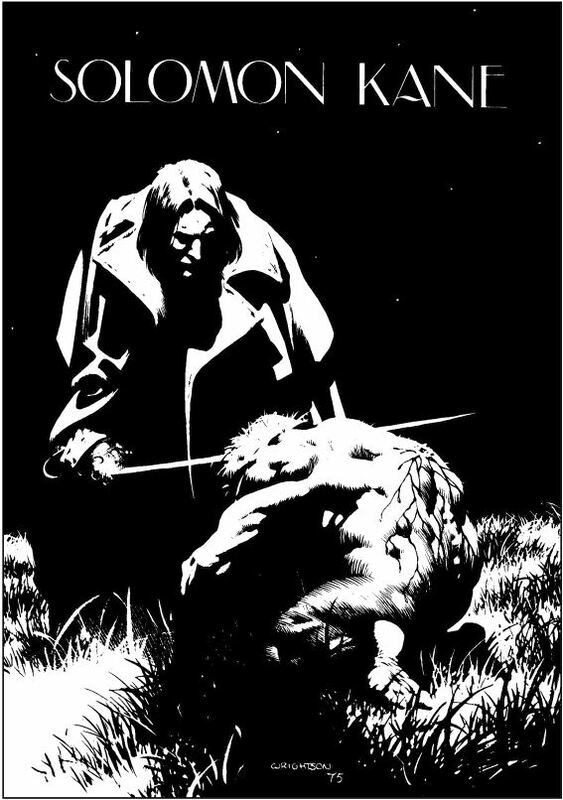 I have to admit that I have never read the poems and stories, but I was a big fan of the comic book back in the day. I know, some Robert E. Howard fan I am. 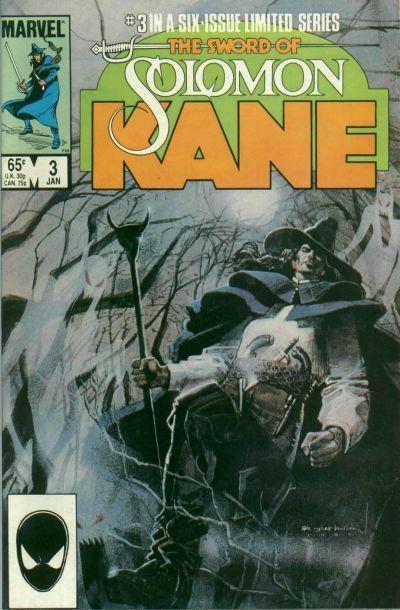 The comic-book incarnations, mainly THE SWORD OF SOLOMON KANE, featured six issues from ’85 to ’86, all but two of which are directly adapted from Howard’s stories and poems. The art was as pitch black as the narratives and told the story of a man who has left a life of blood-soaked piracy behind and became a puritan after discovering that Satan has designs on his soul and means to get it, sending his minions after him, while Solomon travels the earth, fighting the evils of the sixteenth century. Solomon’s world is dark, menacing and fraught with death, monsters and evil sorcery. There are no rays of light through the clouds, just darkness and evil magic. On finding out about Bassett’s film version I was skeptical, really skeptical. Like, I'm thinking it’s going to be DOOM (2005) with a sword, kinda skeptical. Sure Bassett was better news than say Eli Roth (like Eli Roth would know who the hell Robert E. Howard was), but who would give him money to do a movie based on a story that has a guy in a buckle-hat fight evil with a couple of swords and a musket? And take it seriously. Amazingly, long-time genre producer Samuel Hadida did just that. 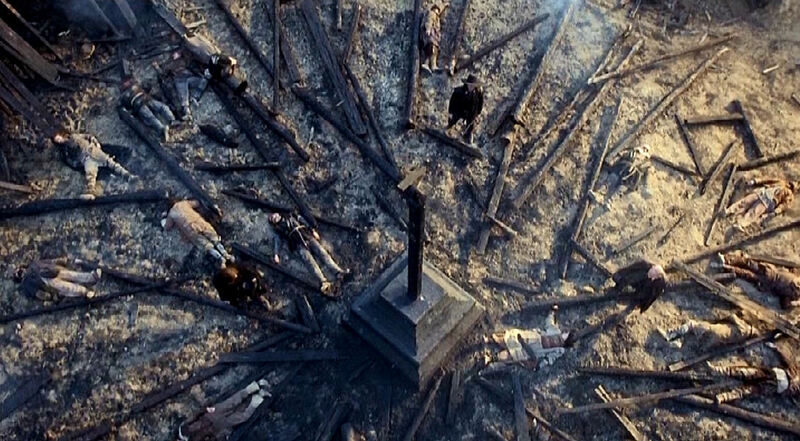 Set in the 1600s (rather than the 1500s), the film opens with Captain Kane (James Purefoy) cutting a swath through Turkish armies in Northern Africa to claim the legendary fortunes of local lord. After finally making his way into the castle, his bloody crew are pulled into mirrors by demons and Kane finds himself trapped in the throne room with the desiccated body of the lord and a fortune in treasure. 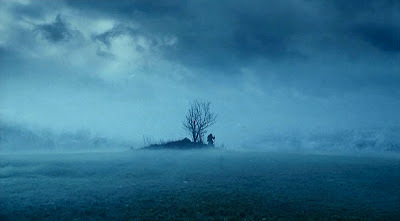 As he reaches for the treasure, the room goes cold and a wraith appears informing Kane that his time has come and he is here to collect the devil’s due: Kane’s black and evil soul. Naturally Kane doesn’t go quietly and ends up throwing himself out of a tower window. Years later we find Kane has been living in a monastery and has devoted himself to doing penance for his crimes. Unfortunately the Abbot feels that the devil’s minions will soon find him and he must leave the monastery to find his destiny. Kane heads out on a path back to his ancestral home, a place where he accidentally killed his boorish brother (Samuel Roukin sporting hair extensions that make him look an awful lot like Ade Edmondson in BAD NEWS). 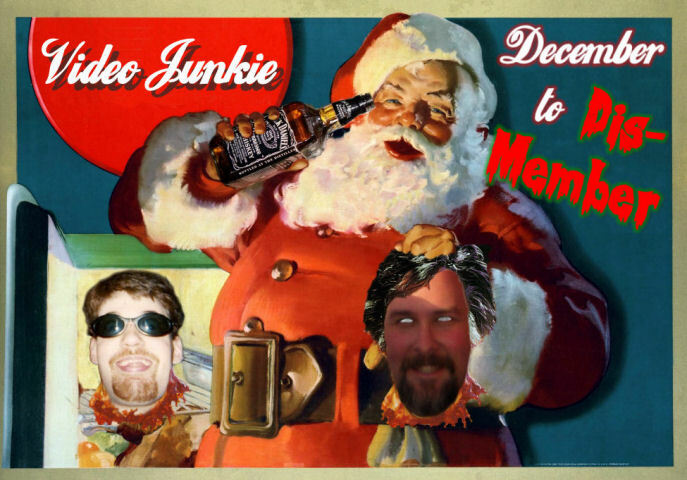 After being found, left for dead, by a puritan family, he discovers that, as they say, a great evil is upon the land. A sorcerer living in one of the castles of the region uses a hulking brute with a leather mask to enslave the local populace and kill those who are too weak for war. Why? Well, we never really find out, but presumably it is the Devil setting a trap for Kane. Solomon’s world here is every bit as bleak as it should be. The skies are perpetually dark and either snowing or pouring down rain, on every tree hangs a corpse, over every hill is death and ashes. 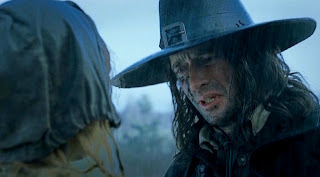 More of a series of vignettes than anything else for the first two acts, Purefoy is absolutely flawless as Solomon Kane. Brooding, angry and wracked with guilt over his life of bloodletting, he elevates this movie to a level that it would have never achieved otherwise. You could accuse him of a monodimensional performance, but like many classic rock and punk bands, they may only be giving us three chords, but those are three freakin’ badass chords! The cast is rounded out nicely by Pete Postlethwaite as the head of the puritan family that finds Kane, and who’s death is a catalyst for Kane’s path of vengeance, Max von Sydow as Kane's father, and Mackenzie Crook as a priest with his own way of dealing with the evil in the land. Bassett’s first film DEATHWATCH (2002) was one of a handful of WWII themed horror films to be released around the same time and while it was well shot and reasonably entertaining, it suffered from a somewhat predictable script and a weak third act. SOLOMON KANE proves Bassett still needs to work on this to grow as a filmmaker. The film, while tremendously entertaining, still suffers from the exact same malady. It doesn’t take much thought to figure out exactly where this movie is headed once the foreshadowing has been laid down. In addition to being somewhat predictable there is a general sense that it’s been done before. You could make a case that Bassett is giving nods to the classics of the genre, such as the crucifixion scene where Kane pulls himself down from the cross in almost the exact same way Lee Horsley does in Albert Pyun’s masterpiece of the genre, THE SWORD AND THE SORCERER (1982). It would also be easy to make the case that he is pulling a Tarantino and simply using someone else’s creativity in place of his own. 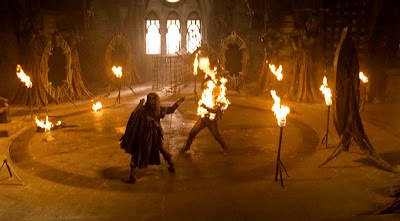 In addition, the evil sorcerer’s throne room in SOLOMON KANE features a “wall of souls” that mimics Xusia’s infamous sarcophagus in the very same Pyun classic. Hell, the guy who gathers a small army to help Kane raid the castle (Philip Winchester) actually looks a bit like Simon MacCorkindale here! You had me at "firesuit swordfight"
Probably the most damning thing is that I think Michael J. Bassett must share my film collection as the plot line of SOLOMON KANE could be summed up as “two brothers, one presumed dead, meet again in battle. The thought dead brother is the masked henchman of an evil sorcerer who hides in a castle spreading evil throughout the land,” which is the exact plot synopsis for THE IRON WARRIOR! Granted the movies approach these themes from completely different angles, but that feeling of sameness nags throughout the film in part due to this comparison. 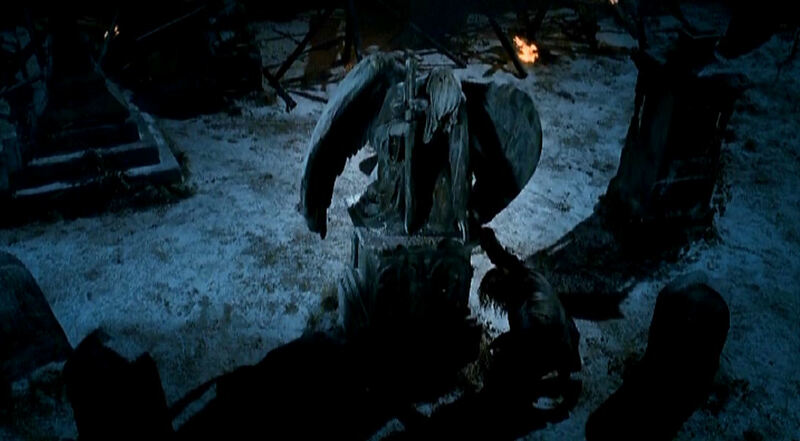 Additional stumbling include the weak character of the villainous sorcerer Malachi (an amazingly uninspired performance by the overrated and over-used Jason Flemyng) who doesn’t even appear until the final minutes of the film and does so with an obligatory CGI monster. This adds up to a real failing in the final act. Getting there, however, is a blast! Even with all of the negatives, this is a hell of a lot of fun and an easy contender (out of two) for best Sword & Sorcery film of the decade. Anyone with even a passing interest in the genre should definitely check it out. Unfortunately, a full year later after its release overseas, it still seems to be having some issues getting a distributor here in the US (apparently Lion’s Gate has toyed with the idea in their typically indecisive fashion). Hopefully someone will be smart enough to figure out that this is not another JONAH HEX and give it a proper theatrical push. They’ll definitely get my ten bucks. An excellent review. I may not love The Sword and the Sorcerer as much as you do (in fact I really don't like it at all! ), but I do agree Solomon Kane is a contender for the best S&S film of the decade. Indeed, I consider it one of the five Sword-and-Sorcery films that are actually pretty good films in their own right. I'm rather unforgiving when it comes to S&S cinema, though. I must point out, however, that the characterization of Kane as "brooding, angry and wracked with guilt over his life of bloodletting" is something invented in the films. 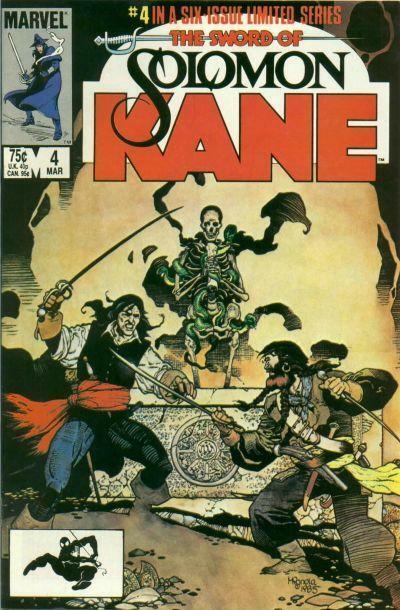 Neither the original stories or the comics depict such a thing, and in fact the idea of Kane being a murderous pirate at any point in his life directly contradict several stories. There are moments in the film where Purefoy *nails* Kane, as in Howard's Kane, but the angsting pacifist is not that. 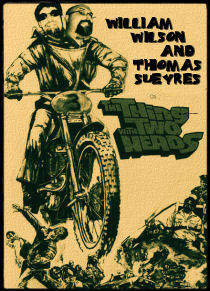 It's like Conan the Barbarian: a film that's at its best when you divorce it from consideration as an adaptation. Even though I hate the alterations it made to Kane's character to the Nth degree, I made a point of trying to see it on its own merits, and it is a worthy enough film for all that. I agree there are scenes that seem a little too familiar - the idea of it sharing anything in common with Ator fills me with dread - and that Bassett is an imperfect director, too. Thanks for the feedback, glad you enjoyed the review. I'll be the first to admit that I am not an expert on the subject, but as far as Kane's alleged life of piracy is concerned, in one of the poems, he claims to have sailed with Sir Francis Drake. Drake carried a Letter of Marque from the English crown, which made him a pirate to everyone but the English. In this same poem Kane protests Drake's shipboard trial and execution of Thomas Doughty for witchcraft. Since Kane's back story is never explicitly laid out, it's easy to see why you might walk away from Howard's writing thinking that he may have lead a life as a pirate, or at least spent some time as one. 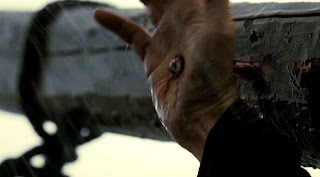 I agree that the pacifist angle was a little over-wrought and maybe unnecessary, but I've found if you expect absolute literal accuracy from every film adaptation (be it book, comic or video game), you are going to walk away disappointed every time.